What if you are a real alcoholic or a real drug addict? What if you have tried these methods along with countless rehabs and still find yourself drunk and high? Recovery is not going to happen because you need it or want it! Becoming recovered happens to those who do the work. Our experience as real deal alcoholics and real deal drug addicts is that we had to have a Spiritual Experience as the result of all 12 steps to recover. This cycle below illustrates step one. 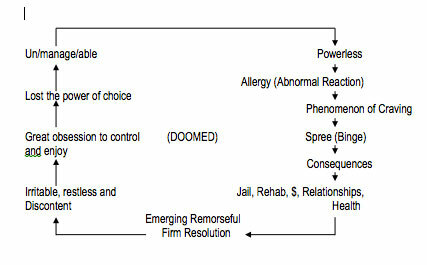 If you are reading this you are probably at the bottom of this cycle (firm resolution). Our experience is, this will continue over and over unless a Spiritual Experience is acquired.